have just replaced the standard front bumper on my 1999 TD5 with a winch bumper with integrated driving lights that plug into the front fog light loom. I am getting power to the switch on the dash but nothing happens when I press the switch. With the rear fog light switch you can hear the relay in the dash click and the light on the switch comes on and the fog lights work. I am suspecting the relay (assuming there is one) but the voltages at the pins on the switch don't change when the switch is depressed so with my pathetic electrical knowledge I am also suspecting the switch.....? I have fitted 235 x 85 mud tyres on steel rims and looking at the front it looks like it will be awfully close between the front of the tyre and the washer bottle at full bump with tyres straight ahead. Do I need to change the washer bottle for something more compact? Please don't suggest removing the springs to check this!! The switch provides 12 volts to the relay, one tag at least must be low before the switch is operated then full 12 volts when the switch is on. It sounds like the switch is dodgy, try WD40 in it before buying a replacement. If all tags on the switch are at full 12 volts all the time then the switch is locked on and needs replacing. And there is another fault to find, suspect a relay too. And 235/85 tyres generally go with at least +2" lift. There is a good tyre guide around called (I think) 'Will it fit' for the D2. I always reckoned the washer bottle needed some additional stone chip protection, sounds as if it is well tight without so yes, something smaller might be wise. My front fogs only work when the engine is started,l. From memory I had the same symptoms as you. I haven't checked if this is normal - like you I have a replacement steel bumper with LED's. Also something to bear in mind - on the D2, the "switch" is momentary - it doesn't directly switch a relay, it sends a signal to the ecu to tell it to switch on the foglights. From memory from my old truck, engine needs to be running in order for the ecu to have acceptable voltage etc - as was said above. Thanks folks. I'll soak the switch and see what happens. Engine was running during the tests. Tyre wise I have a 2" lift and am definitely not going to a smaller size - I guess I shall have to look out for witness marks on the tank or an absence of screen wash! OK so I have read the D2 electrical library for the front fogs and even understood some of it! The switch is working (when checked properly ) as the correct earth circuit is formed so I then looked at the relay in the engine compartment fuse box. Swapped it with its neighbour and still no luck. 1. Disabled = The vehicle is not fitted with front fog lamps. Fuse F3 is fine for certain. What is also certain is the vehicle had front fogs but stupidly I didn't think to check if they worked before removing and disposing of them! It is an ES spec car so I am pretty certain it would have had the front fogs from the factory. 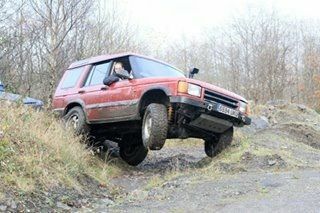 I use that size for off-roading in our D2 (Insa Turbo Special Track) on our approx 2in lifted D2. The tyre runs very close to the washer bottle , but shouldn't touch. I've got cut down inner wheel arch liners still in place & as long as they're tied forwards against the washer bottle pipes, it should be fine. I've used standard offset wheels & spacers / modulars. They're all fine. Biggest issue is the top outer edge of the tyre contacting the top outer edge of the wheel arch or top of the inner wing at full articulation. Jon, has yours got standard ARBs ? Yes, Diff-lock & TC work well on the D2. It's not clear on my profile pic, but there's more about 2 foot of air under the Left front wheel - only possible because of them both allowing progress despite the massive hole / cross axle I was driving through. Shame, but unfortunately inevitable, about the tin worm taking hold on your chassis.